Ed Hochuli will have to make sure to stay warm on Sunday. Here at the FOX Network Center, we affectionally call the area where we work the "Ice" Cube, because it’s kept quite cold, considering that the hot lights shine brightly on the cast of the FOX NFL Sunday pre-game show. You might have heard of the cast: Terry Bradshaw, Howie Long, Michael Strahan, Jimmy Johnson and host Curt Menefee. You know a few of those guys are getting up there in age, so maybe they keep it so cold on the stage because they’re starting to get hot flashes, but I digress. I say it’s cold, but we don’t really know cold. Not Green Bay cold. The game temperature for the 49ers and Packers Wild Card game Sunday on FOX is expected to be around zer–oh. That’s not with wind chill included. That’s just the chill part. With the wind, it could feel like 20–below the O. So how do the officials prepare? Will anything help in their attempts to stay warm? 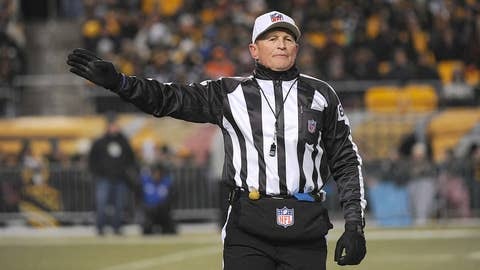 Who better to answer those questions than the referee who will oversee the officiating crew at the game Sunday, Ed Hochuli. Hochuli told me that most of the referees will wear a full body wetsuit as their first layer. Then, they will put on 2 to 4 layers of cold weather compression gear over that — on the legs and upper body. And on top of that, the uniform. The pants of the uniform are heavy as well. The jerseys are lined with a wind breaker-type material on the outside. And what about the parts of the body that are normally exposed, like your hands, face and head? Keeping warm is only part of the problem. Hochuli told me his biggest problem in real cold weather is that the muscles of his cheeks, jaw, and lips freeze, so it’s very tough to enunciate words. He says he has no doubt that will be apparent Sunday. Many might wonder whether Hochuli will wear his famous, tight short-sleeve shirt. He said above zero, he might, below zero no way. But seriously, the head, face and hands are a priority. Hochuli said that all of the officials will wear gloves. A couple of the guys are wearing two sets of gloves. Most of them will also wear a muff with chemical heaters where they keep their gloved hands during time outs and between plays. Hochuli will be wearing neoprene ski socks, plus a second pair of socks over that, plus a chemical foot warmer that fits in the bottom of the shoe. On their heads, they’ll all wear a neck gator and hood under their hats. Several of them have full face masks that will cover up over the nose. They also have hats with ear flaps that come down to give their ears additional protection. The other thing the cold problem presents besides battling the elements, the officials will struggle keeping their concentration on every play. The cold is brutal. Plus, they have no down time, other than halftime. They are always on the field. Most of them never get a chance to go to the bench area, even for a moment to stand in front of a heater. Seems like they’ve thought of everything, right down to the whistle. Some whistles have a pea in them. In weather like this, they can’t use that kind of a whistle, because the pea freezes, therefore, they have to use pea-less whistles. That, is Green Bay cold, folks. Hochuli is definitely the right man for the job in Green Bay today. Nobody concentrates and prepares his crew any better than Ed does. I can’t even imagine, but to show my support, I’m wearing long underwear in the "Ice Cube" today and I have my foot heater on.